FAIR is an intensive treatment for parents referred to child welfare services for neglect and substance use. The treatment aims to build parents’ skills in parenting and address their substance use, while promoting stability through housing, employment, and other supports. Families Actively Improving Relationships™ (FAIR) was designed to address the needs of parents referred to child welfare services for neglect and substance use, including their co-occurring parenting and substance use needs. Previous research suggests many families referred to child welfare for neglect and substance use experience co-occurring risk factors; accordingly, the FAIR program aims to address these risk factors. 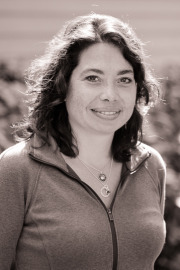 FAIR achieved positive outcomes in a small, randomized pilot trial conducted as part of Dr. Saldana’s recently completed NIDA-funded Career Development Award. FAIR is currently being evaluated as part of an efficacy trial funded by the Administration on Children, Youth, and Families. FAIR is an intensive community-based treatment model that integrates components of two evidence-based behavioral interventions: 1) Parent Management Training (PMT; Patterson & Forgatch, 2010) developed at the Oregon Social Learning Center (OSLC) to increase parenting skills, teach and support positive family interactions, and address mental health problems; and 2) Reinforcement Based Therapy a community reinforcement approach of contingency management (RBT; Jones et al., 2005) to address adult substance use. Behavioral principles from these evidence-based interventions are integrated to address parenting, parental substance use, and any ancillary needs presented by the family (e.g., mental health, housing, employment). Ongoing engagement efforts are utilized throughout the 8 month treatment. Outcomes from the pilot suggest that these efforts were successful with 94% of participants randomized to FAIR engaging in treatment and 87% completing the full course of treatment. 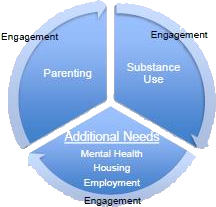 The community-based, outpatient, intensive behavioral treatment involves five major components: 1) Teaching and supporting parenting skills including nurturing and attachment, reinforcement, emotion regulation, supervision, non-harsh discipline, and nutrition; 2) Delivering substance abuse treatment including contingency management, relationship building, day planning, healthy environments and peer choices, and refusal skills; 3) Resource building and provision of ancillary supports including housing, employment, support with court and child welfare attendance; 4) Use of incentives (FAIR bucks to spend in the FAIR store) for success with all treatment components; and 5) Ongoing engagement strategies. To implement and integrate these 5 components into one model, the FAIR team includes counselors, skills coaches, a resource builder, and a clinical supervisor.